Since the beta test program began for GrabCAD print five months ago, over 40 customer-driven enhancements were added by the GrabCAD team to make the package more smooth and functional operating. In addition to the capabilities that were originally roadmapped, new features were added to the program to make working with GrabCAD Print even more attractive. GradCAD Print is available for use on a growing list of Stratasys printers in nine languages. The smooth operation software allows you to print directly from your favorite professional CAD formats, saving hours of time usually spent converting and fixing STL files. The direct print to CAD software supports a variety of 3D printers, including uPrint, Dimension, Fortus 250, Fortus 380, and Fortus 450 with more coming in 2017. Next to this, some business intelligence features on material usage and printer utilization were added to make working with the software even more attractive. Furthermore, scaling and orientation controls support features were added. 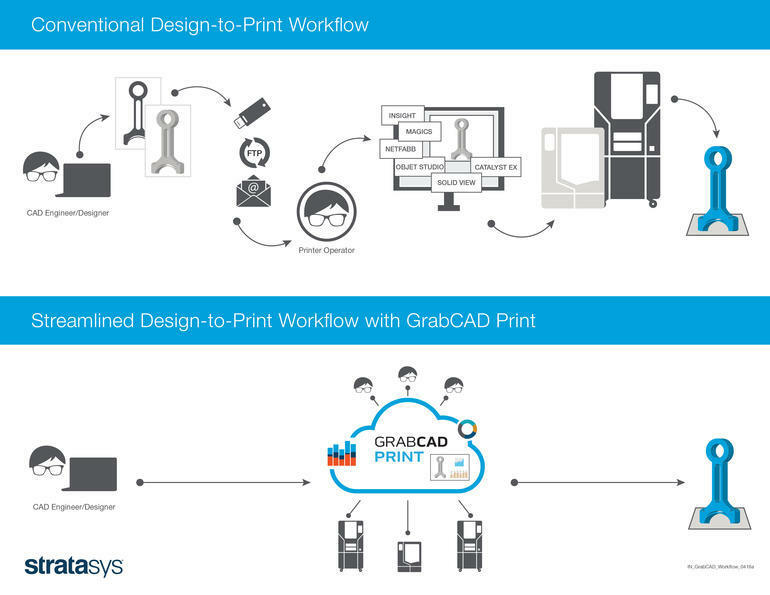 GrabCAD unveils a cloud application that gives its users the power to work – and print – from any location. In places like job prep, scheduling, and monitoring the software will be most impactful. Brainy collaboration is built right in for better application and printer data tracking. Want better tray utilization and advanced layout capability? No sweat. GrabCAD Print’s scaling and orientation support mean your printing efficiencies will go through the roof. With the release of GrabCAD Print, the company also launched a certification test that comes with it’s very own certification badge. From now on, you can show off to the rest of the community your supperior knowledge of GrabCAD Print. The final launch of the platform is another step into the direction of making professional 3D printing more easy and accessible. Linlin and Pierre-Yves are French expert artists, actively involved in the field of Digital Creation. 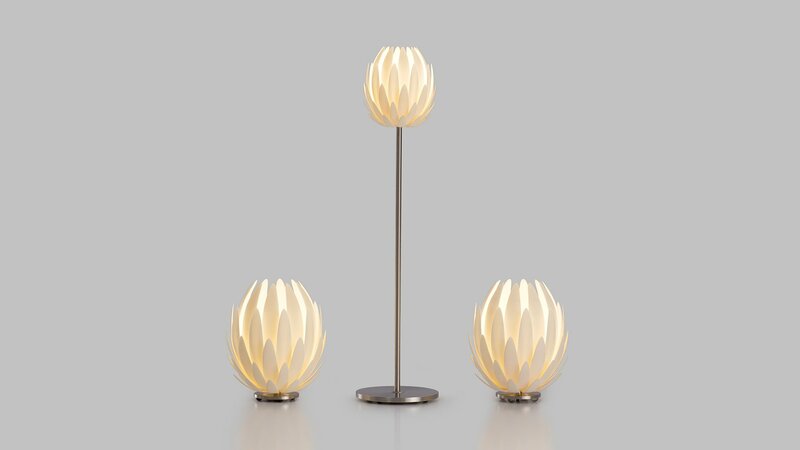 After creating and enjoying beautiful artworks all over the world in the past few years, they finally decided to create a new collection of 3D printed lighting products: the LPJacques Lacelamps. 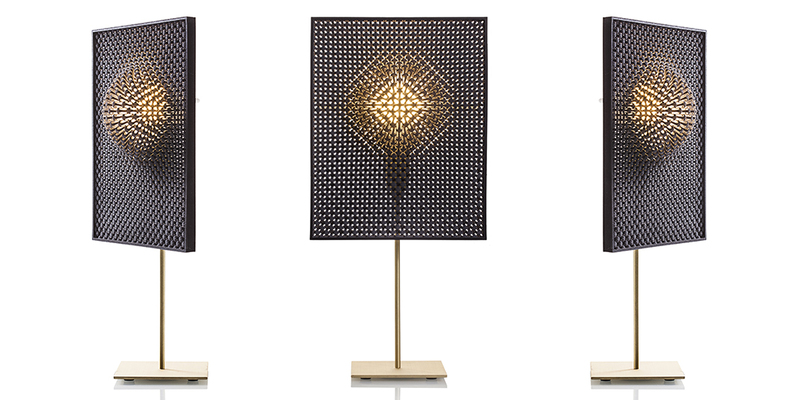 LPJacques Lacelamps ‘Line’ – Blazing beautiful patterns in the room. With the arrival of 3D printing, the works of both designers take on a next dimension. 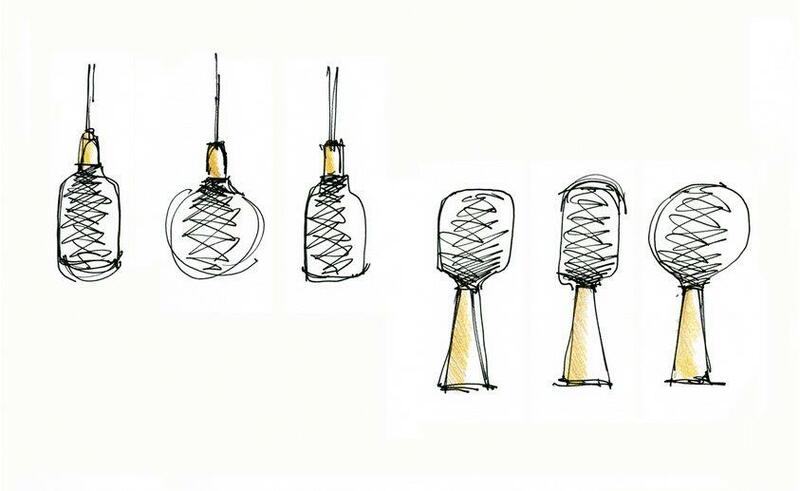 The Lacelamps designs are a fine blend of their common inspiration. Their work is also infused with the ambiance of design minded Paris, where they spend most of their time. 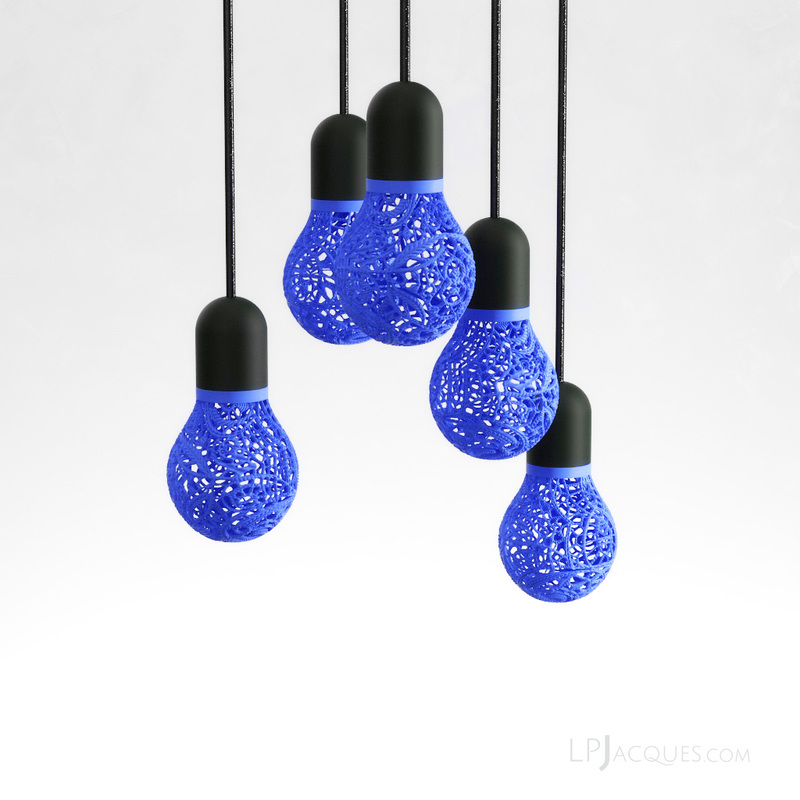 The colored ‘Drops’ Lacelamps comes in a small and medium version. For more information and projects from the succesful LJP designer duo, please also refer to the LPJ Studio website, or just visit our ‘Inspiration Corner‘. 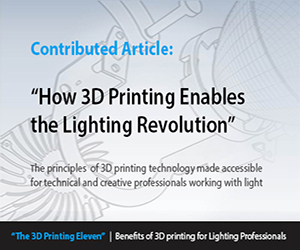 Building upon the research expansion taking place in the SSL Program at Rensselaer’s Lighting Research Center, the LRC’s biannual LED Lighting Institute is also expanding its horizons with connected lighting and 3D printing for lighting professionals. The next course at the LRC, scheduled for Nov. 15-17, 2016, in Troy, New York, includes a 3-day seminar for industry professionals. The seminar covers the latest advances in LED and SSL technology. Next to that, it will include new content related to connected lighting and 3D printing – two up-and-coming fields where the SSL industry can add value and reap benefits for producers and the users of their equipment. 3D Printing of Lighting components. Picture: Lighting Research Center. To support the SSL industry through research that shows the value of lighting beyond energy savings, LRC has set a course in the last year. 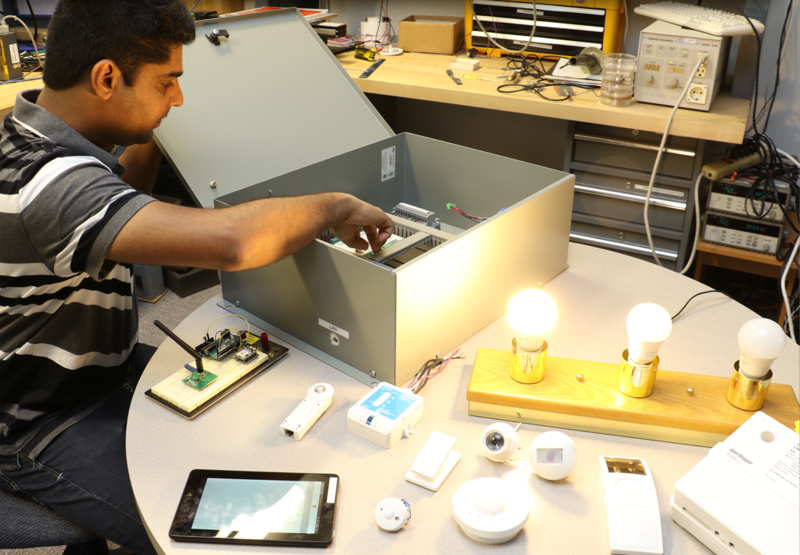 Embracing the trends toward customization and data analytics, SSL research is now evolving to include new developments such as connected lighting (Internet of Things (IoT), and 3D printing of lighting components. 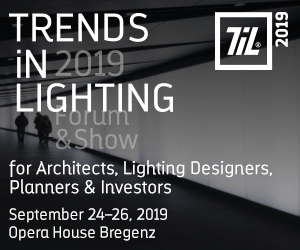 The LED Lighting Institute will highlight these growing trends in the SSL marketplace and help participants learn more about state-of-the-art research in these fields. With the core component of this course being LED and OLED technology, those who attend the LED Lighting Institute will learn the best methods for incorporating LEDs and OLEDs into architectural lighting fixture designs and lighting systems, and compare system components from a wide variety of manufacturers to determine operating characteristics, rated life, lumen output, distribution, and other important specification factors. The program culminates with participants designing, building, and evaluating their own lighting fixtures. This intensive workshop continues to grow in popularity, so early registration is recommended as enrollment is limited to 30 students. Meanwhile, over 800 people from around the globe have completed the course, which is held in spring and fall each year. 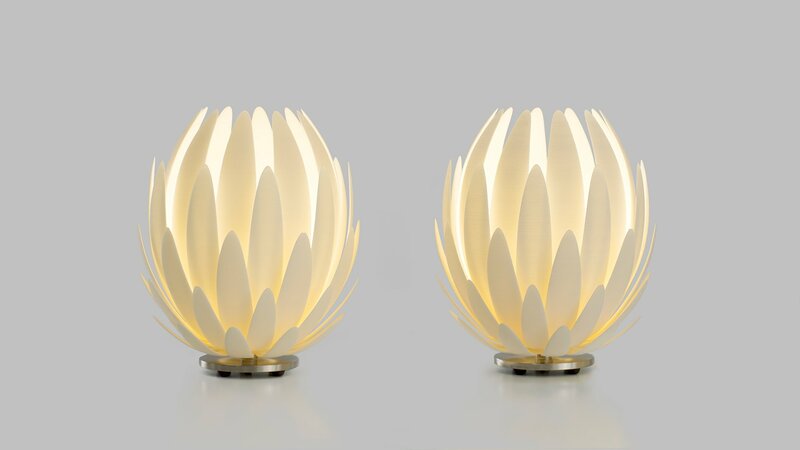 In an exclusive movie by Dezeen, released earlier this month, Janne Kyttanen explains how he designed the flower-shaped ‘Lily’ lamp back in 2002 as a demonstration of how 3D printing could be used to create desirable lighting objects for the home. Back in 2002, 3D printing technologies were much more expensive than they are today. The key to the success of this particular product was making it small enough to be affordable, according to Kyttanen himself. 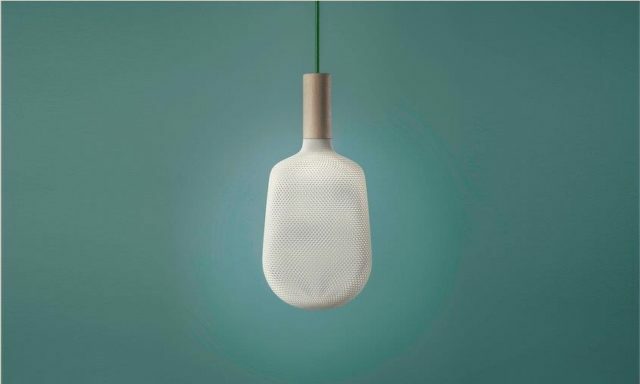 On the contrary to what he expected – the fixture was originally designed for private use – the light caused a stir when it was in 2003 presented at Milan Design Week. By showing how 3D printing – previously considered a prototyping technology only – could be finally used to create consumer products as well. 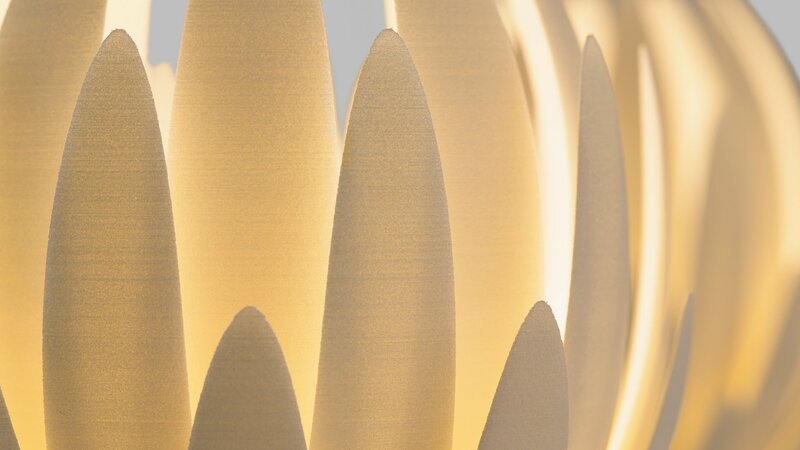 Kyttanen’s Lily light, which he designed during his time in his studio ‘Freedom of Creation’ (Amsterdam, NL), is a lamp created by selective laser sintering (SLS). The form reminiscent of a water lily flower. It’s been made of polyamide, a very fine powder used for SLS processes. 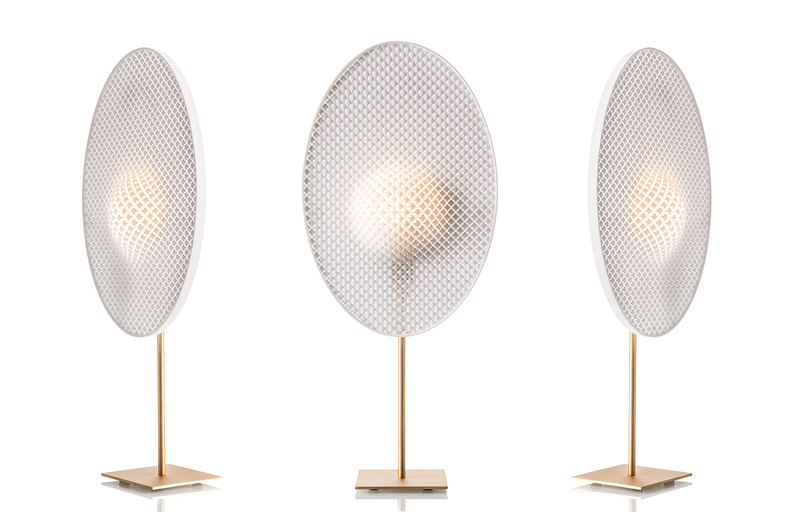 3D-printed as a single piece, each Lily light features a series of extremely thin petals. 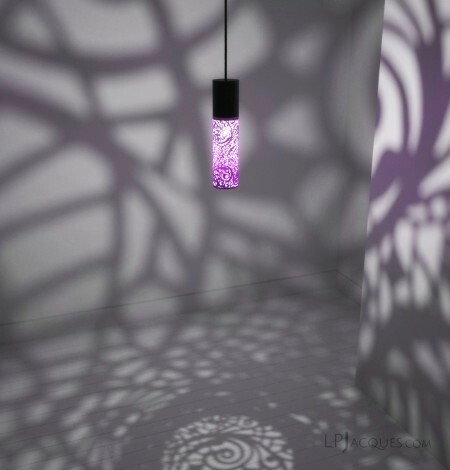 When the light inside is turned on, the petals start to glow and reveal the tiny layers of plastic the lamp is composed of. While the Lily light itself is not currently available to be downloaded and printed at home, Kyttanen suggests the proliferation of affordable desktop 3D printers in the years since the light launched show his instincts about the future of 3D printing were right. 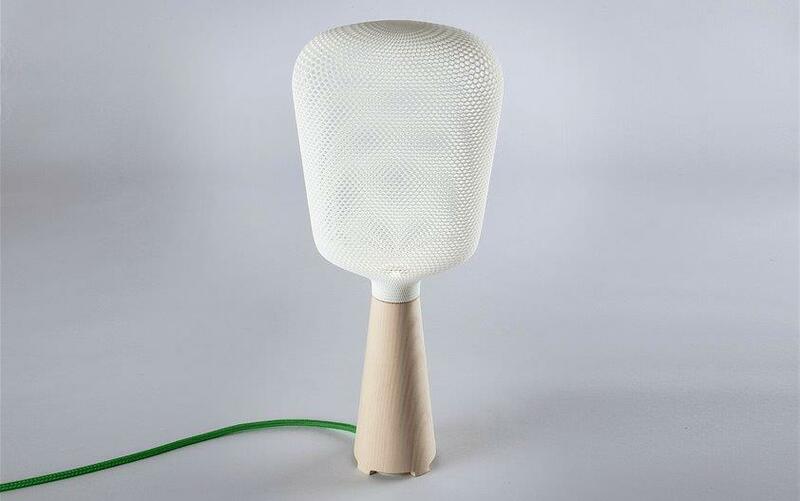 The Lily light is manufactured by the Belgian 3D printing company Materialise. The product – which comes in a table and floor-standing version – is still available for purchase. This post was inspired by Dezeen’s article and interview with Janne Kyttanen. 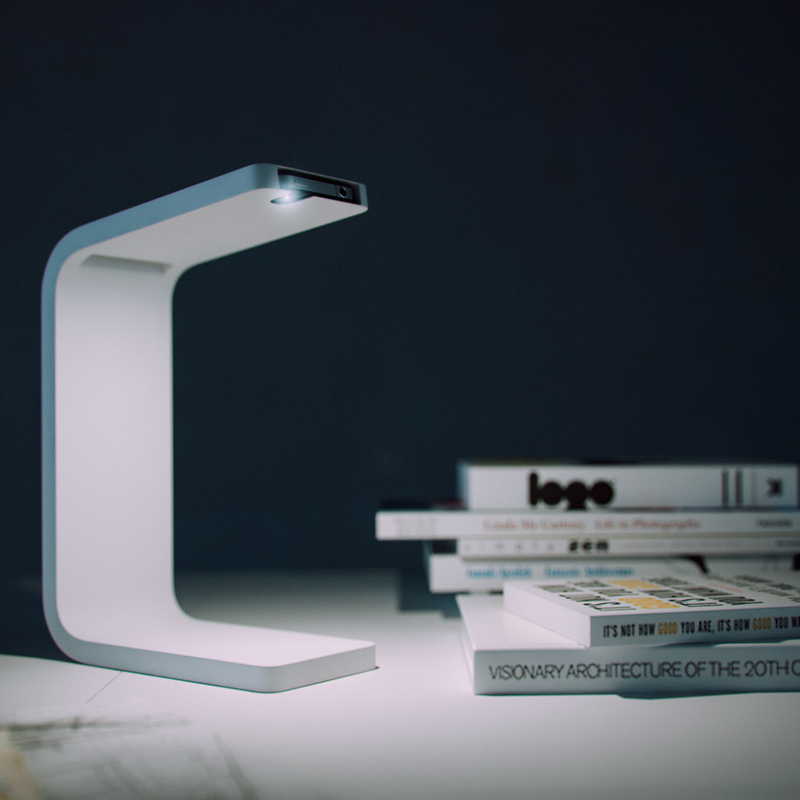 The iPhone Lamp by Ivan Zhurba is a designful eco lamp that can use your iPhone flashlight for reading books , magazines or to listen to your favorite music while the mobile device itself is charging. The lamp is also equipped with a sound amplifier that makes your music sounds brighter and louder. 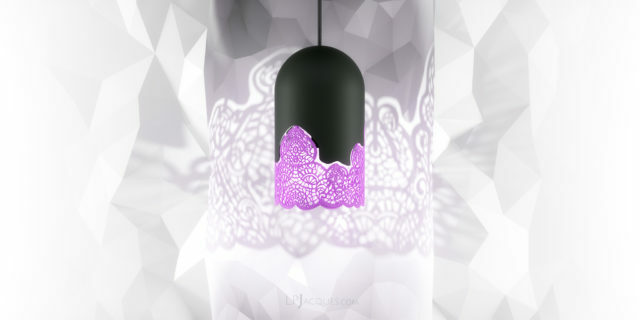 Let’s find out a bit more on this stylish and user-friendly design lighting concept. 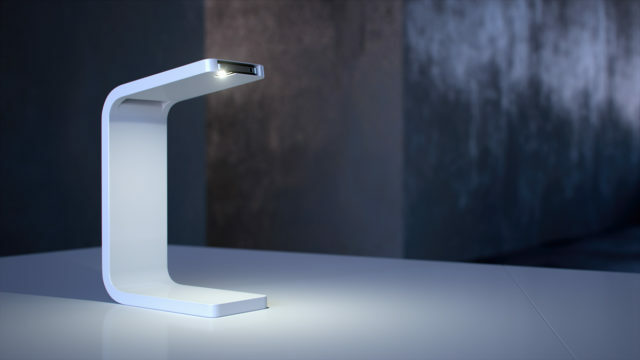 The iPhone Lamp is an elegant, yet simple arm that holds your iPhone. While hidden in its nook, the phone can be used as a functional task or reading light by activating the flashlight feature. 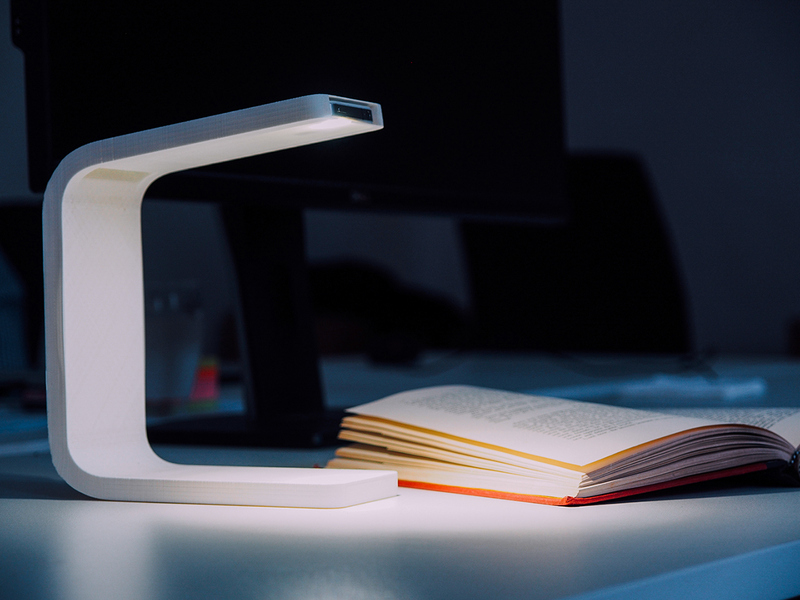 iPhone Desk Lamp – A clean and mean task light for table top use including an iPhone holder. Since the bottom of the iPhone remains exposed, a charging cable can remain plugged into it and reproduce some Spotify or iTunes music over Wi-Fi. The iPhone 4/4s and 5/5c fit into the actual design, and a version for the new iPhone 6 is already under design. AutoCAD 2012 and Autodesk 3ds Max were used to create the initial design sketches, before taking the step towards 3D printing a functional prototype. When writing this article, I thought also about The Relio Flens and F-Sign Table Luminaires that I wrote about earlier. Clean and smart design, combined with user-friendlyness and ease of use. Reading your favorite magazine or book with help of the iPhone Lamp. Pictures in this post are sourced from the website of Ivan Zhurba. Japanese media artist Akinori Goto designed a brilliant 3D printed ‘Zoetrope’ that, when lit from the side, reveals walking or if you like dancing people. The impressive artwork was on display not so long ago at the Spiral Independent Creators Festival in Japan, where it won various prizes. Thanks to the creative brains of Goto, the zoetrope sculpture takes on a new dimension. A flavour of 3D printing makes it even more magic. In the video at the top of this post, Goto explains stepwise how he created the same effect for a previous project, named ‘Toki-‘, a sculpture that instead animates a walking figure. Goto started by creating a 2D time axis of a figure outline taking two steps forward. Thereafter, he converts this progression to a 3D axis, placing it onto a vertical plane. That data is translated into a 3D computer graphic and morphed based on the fourth dimension: time. Then, the model itself was created using 3D printing technologies and placed on a motor-powered rotating platform. After the 3D printing process and the finishing was ready, Goto took a projector and shines onto to the rotating wire grid. 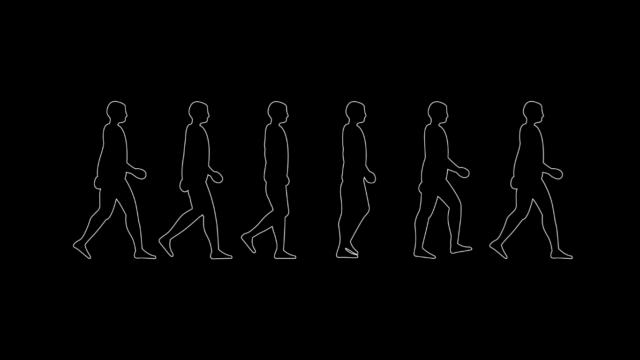 Then, a walking person with an elegant leg lift appears and animates a small ballet dancer. A projector shoots sharp concentrated beams of light at the rotating wheel, illuminating the narrow silhouette of the characters. The sculpture was submitted to the 2016 Spiral Independent Creators Festival, an open design competition in Japan. Here, it won both the Runner up Grand Prix and the Audience Award. Goto has more interesting projects in his portfolio. You can view his extensive collection on his Tumblr website. 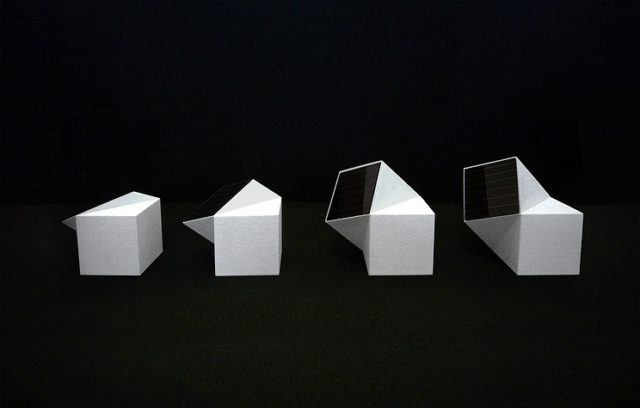 The Latitude Lamp, designed by Nea-studio, is a solar-powered light fixture that emits atmospheric light. The fixture can be fabricated in many different set-ups according to the user’s location or latitude. 3D printing technology was used to convert the initial product idea into a functional prototype. The Latitude Lamp needs to bathe in daylight for eight hours a day, with the solar panel facing the sky. 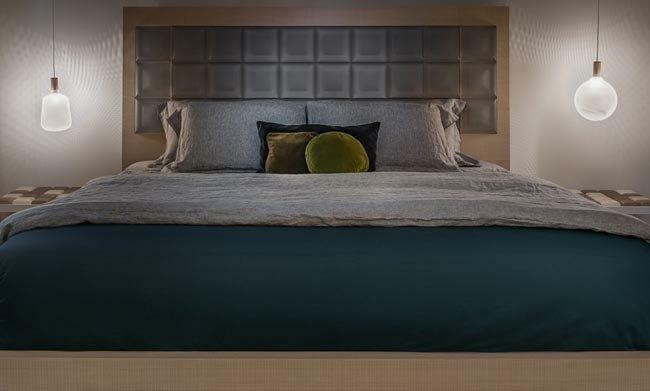 The Latitude Lamp is a perfect example of a product that is tailored for use at specific locations. 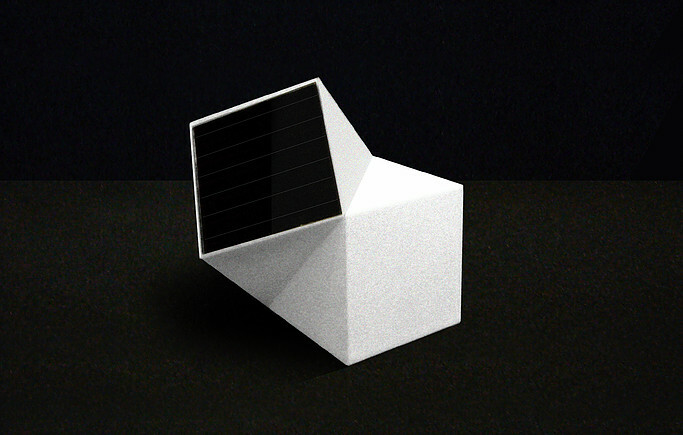 The geometry of the lamp can be automatically updated in a digital CAD file so that the tilt of the solar panel changes according to latitude. By tilting the panel at different angles, the lamp’s capacity for electric power generation is optimized in its perpendicularity to the rays of the sun. The fixture can be used in both indoor and outdoor environments. When getting dark, the lamp will automatically start to light up, glowing gradually brighter from dusk to fall of darkness. Nea-studio is a Brooklyn, New York based studio that was founded back in 2006 by Nina Edwards Anker. The focus in their work is on architecture, product- and furniture design, landscape- and urban planning. 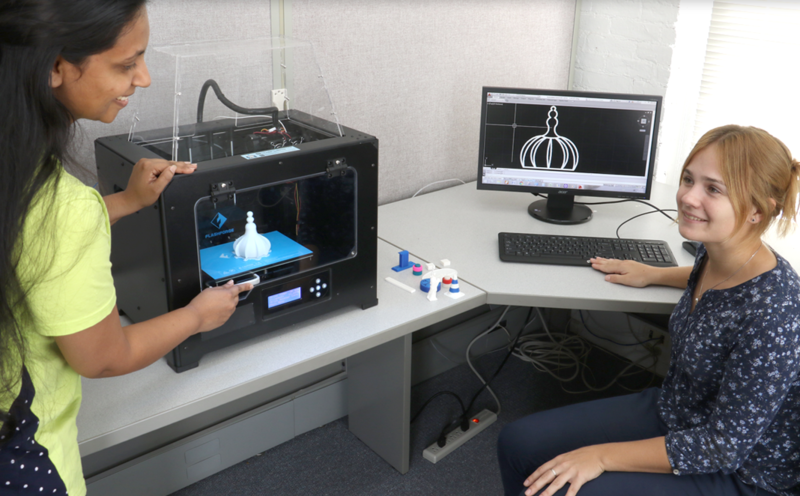 The studio operates in a project environment in which implementation takes place in parallel with model-making, rapid prototyping and experimentation with ideas, materials, and manufacturing processes, such as in this case, 3D printing. The practice maintains a cross disciplinary nature where sharing ideas is an essential part of work philosophy. 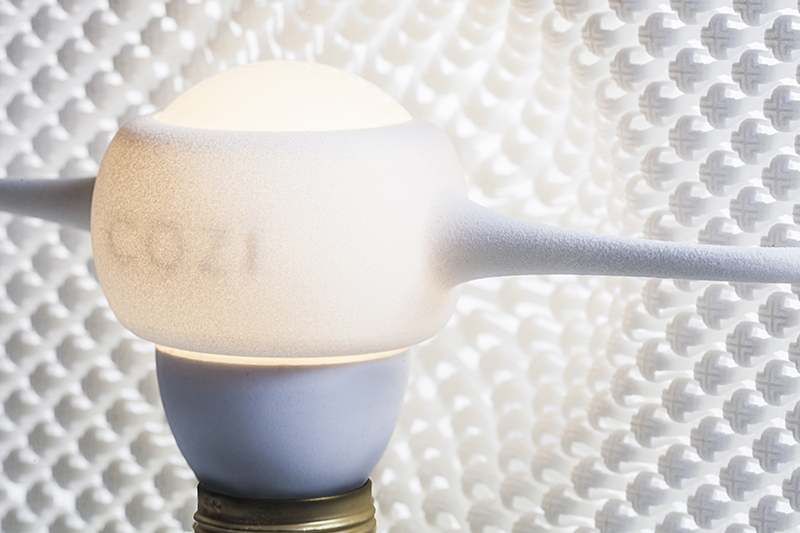 The founders of Cozi Studio, named Yuval Carmel and Ofir Zandani, are two industrial designers that combine a multidisciplinary knowledge of manufacturing techniques. Their studio collection is characterized by a unique morphology, achieved by manipulating traditional materials in extreme and technologically innovative ways. Behind each work lays an idea, a vision. 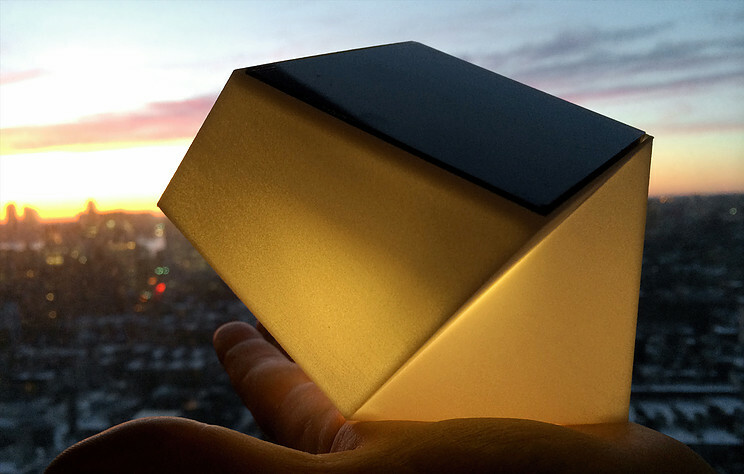 Focus Light illuminates surroundings through 3D printed screen. Through complex mold planning, wood press and 3D printing, Co-founders Yuval Carmel and Ofir Zandani have managed to create complex forms and illusory textural surfaces. By combining advanced technologies with traditional craftsmanship, the statement pieces clearly display the dialogue between the nature of the materials and the manipulated forms. Dissonance between Materials, Use and Shape. There is a certain dissonance between the materials they use and the forms they realize. They force you to look more thoughtfully, and question the very object you see before you. What inspires the designers are the challenges of design and production. They strive to break through technological boundaries, and take heir designs to the tipping point where other designers are afraid to go. 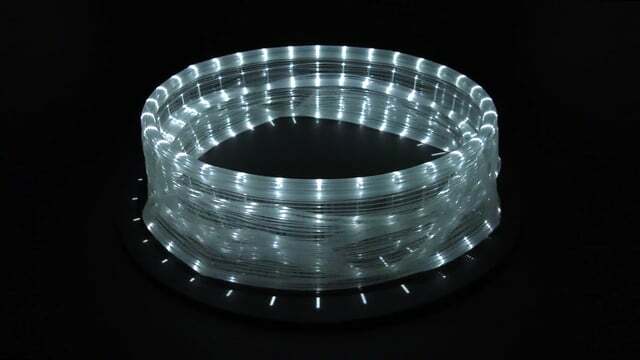 ‘Focus Light’ employs selective laser sintering to generate a flexible and durable three-dimensional piece. 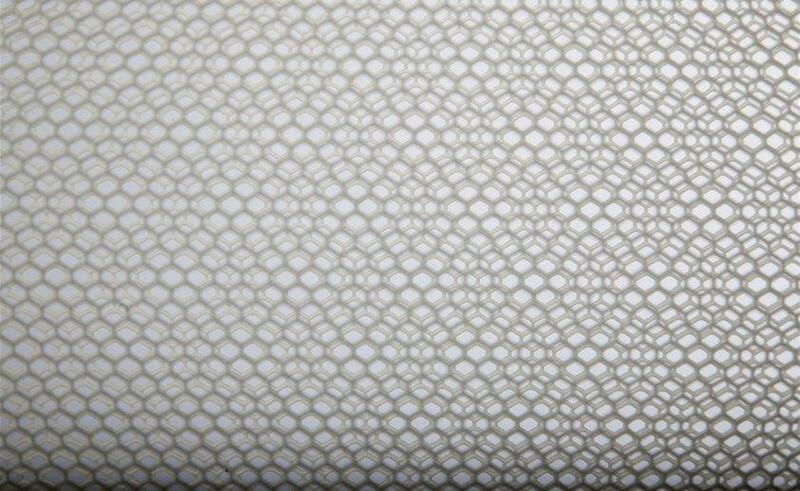 Out of the various 3D printing technologies, Selective Laser Sintering (SLS) suits best the unique printed fabrics. Working with Polyamide Nylon, a laser beam solidifies powdered plastic layer-by-layer using heat in a controlled environment. Unique printed fabrics from Polyamide Nylon. 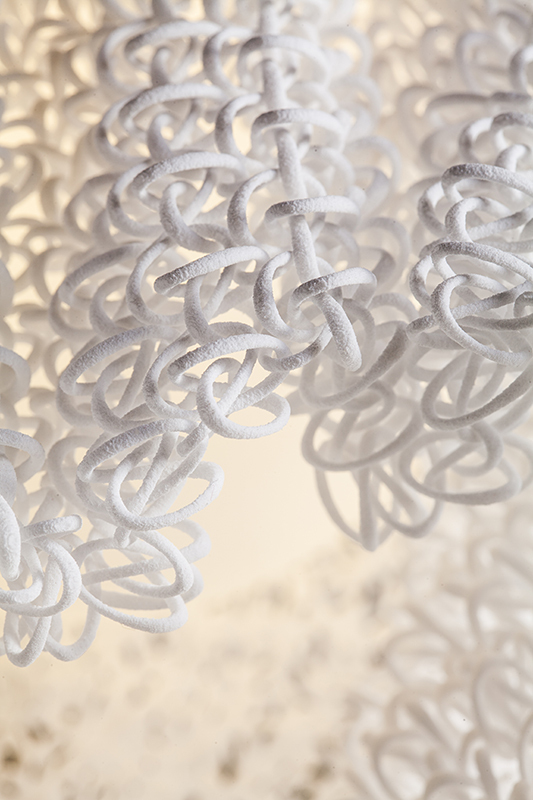 The woven segments are built from the bottom-up and into each other, creating a flexible lace like textile. The different fabrics are meticulously planned on the computer using 3D programming, printed and assembled by hand. The designers aim is finally to create a dialog between technology and craft, between perception and tangibility. Some of the actual objects of the Cozi Studio include the Wrinkles and Early blossom center piece bowls and the Ghost, Focus and Bloom lighting fixtures. You can see more of their work featured at the Cozi Studio website or Designboom. Recently, the 3MF Consortium (3MF) released two specification extensions to its 3MF Core Specification 1.1. The new 3MF Extensions contain a slicing and production extension that allow high-volume additive manufacturing facilities to better integrate and manage their 3D printing operations more smoothly than before. In addition to the initial launch of the 3MF format, the 3MF Production and Slice Extensions to are significant enhancements that move the industry closer to a fully integrated, high-volume additive manufacturing end-to-end 3D printing solution. 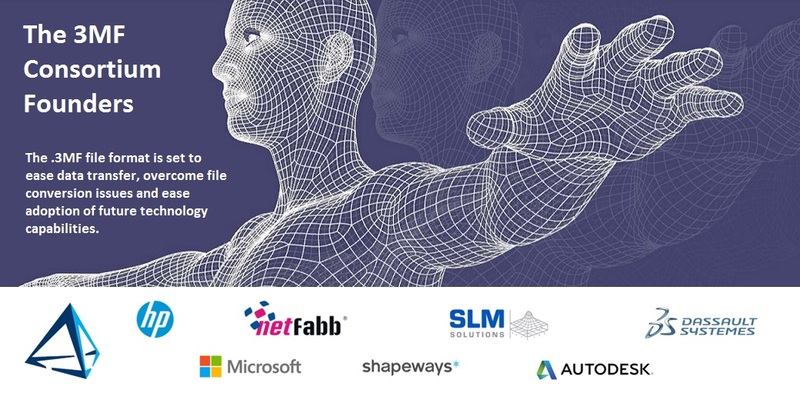 Release of specifications like these aligns with the 3MF Consortium’s mission to help improve the efficiency and productivity of additive manufacturing solutions with standardized software. Designed for high-volume users such as service bureaus, the 3MF Production Extension makes it more efficient for users to organize and manage 3D printing jobs with multiple parts by keeping them in separate .xml files within the 3MF package, thus dividing the parsing load for large jobs. The 3MF package manages the file hierarchy and relationships among the files, as well as keeping unique identifiers for each part instance. High-volume additive manufacturing requires practical software that simplifies the 3D design and manufacturing process while fully describing a model, retaining internal information, color, and other characteristics. The actual extensions were developed to solve in a clear, straightforward manner two critical interoperability issues impacting efficiency and manageability in today’s additive manufacturing facilities. 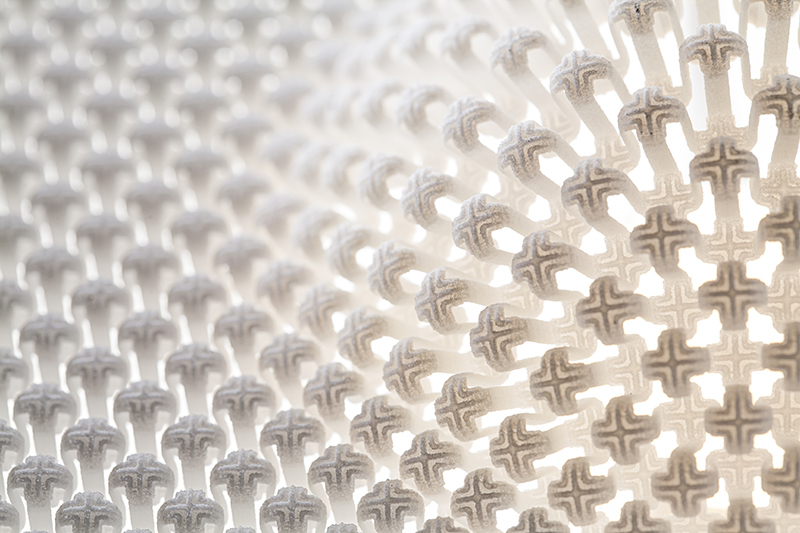 The additive manufacturing industry grew by over $1 billion for the second consecutive year in 2015, according to Wohlers Associates, an independent consulting firm. The 3MF Production and 3MF Slice Extensions are free to download immediately. Back in 2014, Alessandro Zambelli designed some 3D printed lights for .exnovo. Still, they are a fine example of coming up against the bare essentials. 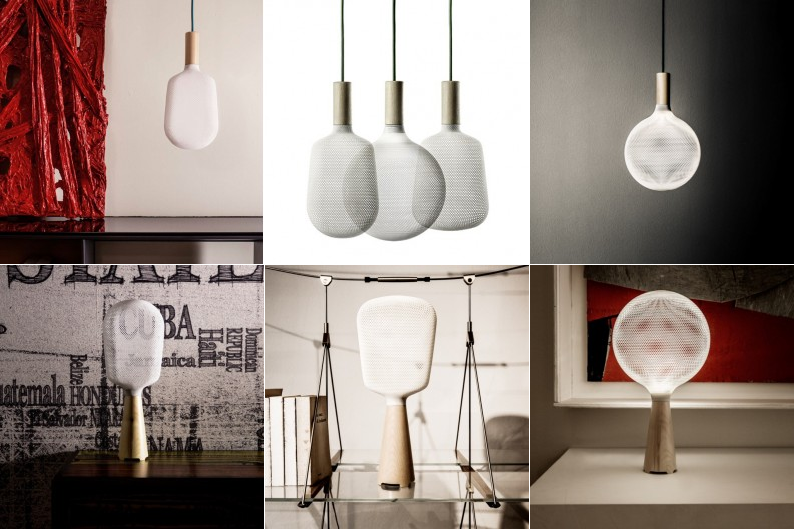 He named his collection of printed pendant and table lights “Afillia”. In botany worlds, where the name originally was borrowed from, it means ‘leafless’. Afillia is surely an apt image for a collection of luminous essentials and airy voids. 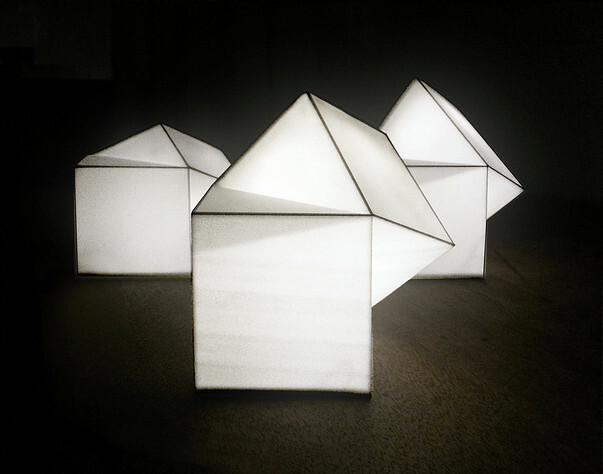 The Afillia range of six light fixtures consists of three table lamps and three pendant lights. The base or socket ring is made from Swiss pine, a premium wood from the Alto Adige mountains. In line with the region’s ancient traditions, it is hand-crafted. The wood fitting locks on to a light diffuser in nylon fibre (polyamide), using selective laser sintering in professional 3D printing. The centre piece of each of the accessories is the diffuser which embraces and embellishes space. Delicate, lace-like patterns with their geometrical pinholes give rise to two-dimensional origami in thin, curvaceous spirals. Lace-like patterns give rise to 2D origami in curvaceous thin spirals. Free to waver at will, the light casts fleeting shadows, then beams into unexpected focus, forming round and bright halos. This is energy in it’s purest fluid form, in the no-man’s land between stuff and shape, air and light. The product range is winner of the 2015 Product Innovation Award and still available for purchase at .ExNovo.